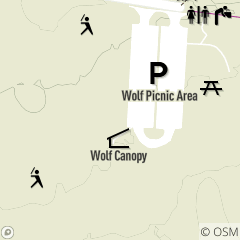 Wolf Reserved Canopy features a 20' x 40' canopy and is located off Porter Creek Drive in Huntington Reservation, near the Wolf Road entrance in Bay Village. Availability: Canopy is reservable June through September, daily. For reservations or more information, call 216.635.3304 Monday through Friday, 8:30 a.m. -- 4:30 p.m.